Dan Absalonson | Author of SciFi & Fantasy: I'm a Contest Winner! Over at View From Valhalla, @odin1eye as he goes by on Twitter, reviews and interviews podiobooks authors. So right away, you know I'm a huge fan - anyone who promotes podiobooks is the man in my book. This is definitely true of Odin1eye, don't take my word for it, pop on over to his site and see the large number of great reviews he's posted. Also, for those authors looking to put your fiction into audio form, he has lots of great interviews asking Podiobook authors how they do it. He even has some of his own fiction over there. New to podiobooks, and don't know where to start? I have a blog post recommending some of my favorites, but go over to his site for a ton of more extensive reviews to see what many of the books are all about. Also, leave comments on what you thought of his reviews. That's what I did, and it instantly entered me into a contest to win a free signed book he has reviewed of my choice! And guess what, I won! 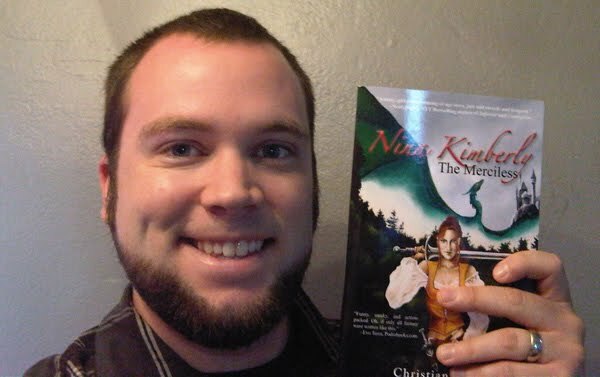 I chose to have Nina Kimberly the Merciless by Christiana Ellis sent to my doorstep, and she even threw in a Casey's Cadets pin that looks like the image to the right of this text! Click on the book title link and go listen to the entire novel yourself for free! It has a dragon it in, and the protagonist is a female, so not your average fantasy novel. If you're more a fan of Sci-Fi, then check out another book related to the image above by her called Space Casey, a really fun podiobook. Again, listen to the whole book for free! That's why I love Podiobooks.com. Thanks again to Odin and Christiana for the signed free copy of the book! Thanks for the shout out Dan, but thanks even more for being a fan and supporter of podiobooks and podcast fiction. I am glad to have been able to help you get a copy of Ms. Ellis's wonderful book. Isn't she a peach? Thanks again, and enjoy! For sure! This has been a win win situation, I LOVE podiobooks, and hope to be a podiobooks author myself someday. It will be an honor, as it was to win your contest. Good on you!